Jo Anne Kliewer passed away peacefully on September 5th. She was 89 years old and had led a wonderfully rich life, full of family, friends, activities and travel. Though born in Kansas, she carried in her heart the true spirit of California. She loved playing bridge and poker with her many great friends, and was an active member of the Racqueteers Tennis Club for decades. 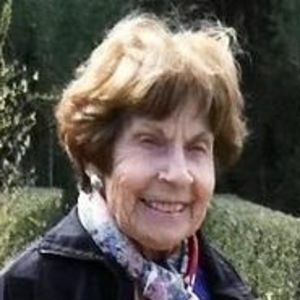 Jo Anne traveled extensively and adventurously, both in Northern California and internationally. Yosemite Valley was her favorite destination of all, closely followed by Lake Tahoe. She was also an enthusiastic gardener, and a great lover of reading and history. She was especially proud of her roles as a mother, grandmother and great-grandmother. Her dedication to her friends knew no bounds, and she loved hosting and entertaining in her San Carlos home. A dog lover as well, her enduring favorite was her rescue dog and companion, Mollie. Jo Anne was a tireless giver to a large range of charitable organizations, and her generosity will be missed. An unfortunate series of events curtailed her activity in recent years, but her life-long determination to learn and grow, and her love of family and friends sustained her. A Memorial Service for Jo Anne will be held on Wednesday, September 19th, from 1-3pm at the Twin Pines Lodge, 40 Twin Pines Rd. in Belmont. Donations in her memory may be made to the Yosemite Association and The Marine Mammal Center in Marin. Add your thoughts, prayers or a condolence to Jo Anne's guestbook. Please enhance this tribute to Jo Anne by adding your memories and photos.